Steel handle with secure grip. The blade base is flared outward, forming a guard when opened. 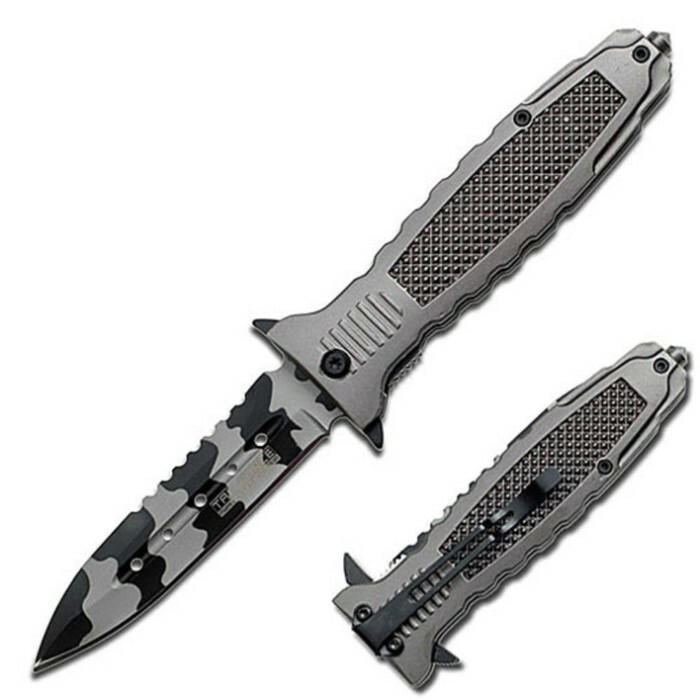 Sharpened 440 stainless steel blade with urban camouflage finish. Single edged blade with double edged look. The back (spine) of the blade has a faux edge. For eight bucks... bout as solid of a spring action as you can get. got the black, this one, and the titanium ones and they are all of the same workmanship and really solid quality. came pretty sharp, and they lock open really strong. pretty impressed, as per usual with this sight. i would recommend. Great knife!, it arrived 2 days after ordering it, true swords never fails to deliver. it came a little dull, but thats not a problem, no play in the blade and the spring and clip are very sturdy. for 8 bucks how can you not buy it. This was back ordered but it still came with in 5-6 days, very good customer service. For eight bucks you can't go wrong with this knife, assist works well and the blade is a beauty. Came dull of course, but that can be fixed easily. The blade is very sturdy, no wobble what so ever. There is one thing that I don't like and that when the blade is out and you move it, there is a clicking noise. Doesn't effect anything so it could just be me. Overall good purchase once again from trueswords.